Generally there are two different types of fish suited for living in a Garden Pond. One is koi and another is goldfish. Not all goldfish are best kept in ponds and the choices are usually limited to those fast swimmers and hardy varieties. Shubunkin and comet goldfish are two fine examples because their shapes and different mix of coloration are better viewed from above. 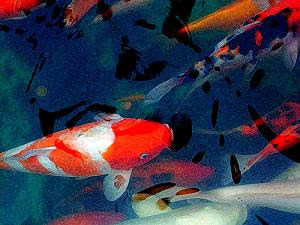 Koi and goldfish can also be kept together in the same confinement and so far based on my experience they will not show aggression towards each other although they are from different fish species. Both koi and goldfish are known to adapt well to harsh conditions and mild fluctuations in pond water temperature. During summer when there is low dissolved oxygen, the fish generally becomes less active and during this period, one must ensure that aeration from air pump are performing at top notch condition. During winter when the water starts to freeze at the top layer, both types of fish are known to survive through this period by remaining dormant underwater. Despite their hardy nature, one must never neglect the general maintenance needed to keep the fish healthy such as doing routine water changes and pond cleaning to remove fish waste, feeding the fish with supplemental fish food and servicing the water filters. Depending on the size of your garden pond, your choice and selection will determine which type of fish among those two that you can keep. A smaller sized garden pond measuring less than 3 feet in depth is generally suitable only as goldfish pond. However if your intention is to setup a koi pond, then you will need larger and deeper pond (at least 4-6 feet in depth) that can accommodate at least 5000 gallons of water. Usually the best period to add the fish is during early spring because that is the time when the water starts to warm up and the fish will have enough time to acclimatize and adapt to the natural water condition before summer. Let's also look at the design considerations and what to look for when building your first koi pond.